Remember the other day I was moaning about how I always buy too much fabric and end up with lots of little lengths left over? 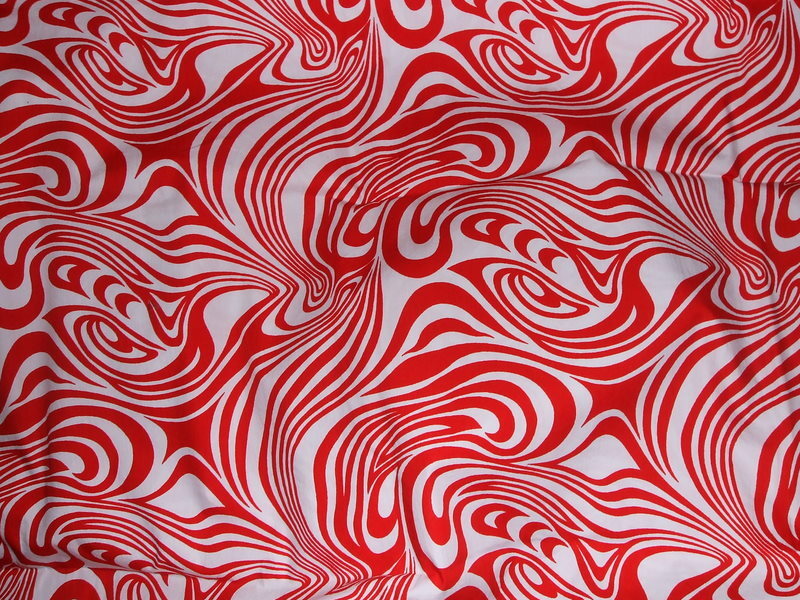 Well the stash gods heard me, got in their time machine, and went back two years to my very first visit to the fabric shops of Goldhawk Road where they caused me to buy a very sensible two metre length of this swirl print cotton. Normally I’d buy two and a half metres to be on the safe side, and end up with half a metre left over. So buying two metres was obviously the appropriate and responsible decision, and if I’d used it to make the McCall’s 5799 minidress I’d originally intended, two metres would have been the perfect amount. And now I want to use it for my wrap dress project instead, and it’s about 10cm too short! No matter how I arrange it, the pattern will not fit on the fabric. If you’re wondering about the big space on the bottom right, that’s because the back piece is cut on the fold so it’s taken up by the other half of the back. 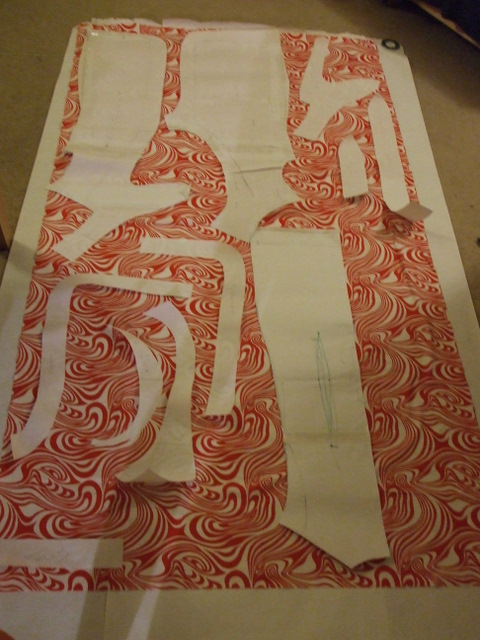 The pattern has no seam allowances and a few of the other pieces need to be cut twice so it’s even worse than it looks. No way can I arrange the three big pieces without something overlapping. And all I need is a tiny bit more length. I have learnt my lesson. And now I’m off to cut the wrap dress out of this gloriously 70s polyester bought on the same trip. Another two metre length – but 150cm wide. Posted on November 9, 2011 November 8, 2011 by catherinedaze	This entry was posted in Cutting, Death Star dress, Fabric, Rants and tagged dressmking, fabric, sewing. Bookmark the permalink. Oh I hate when that happens! 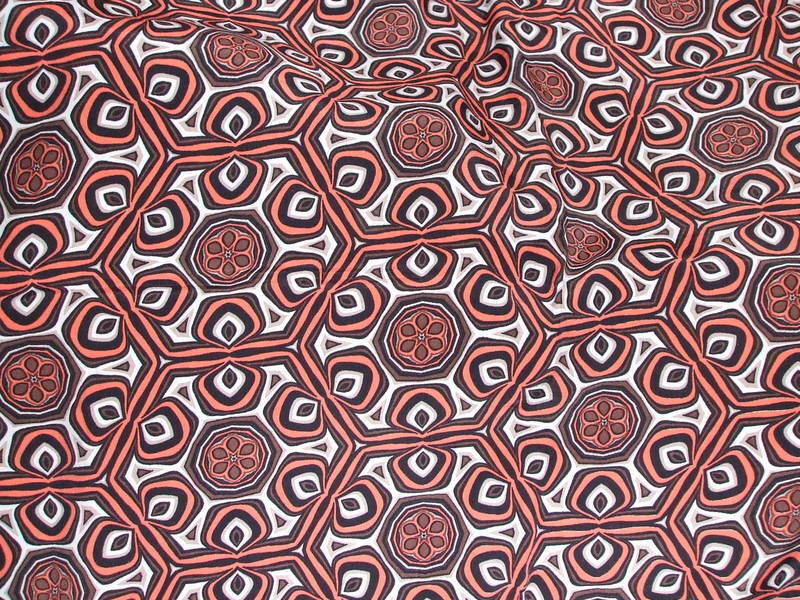 That’s a great print too for a wrap dress. What if you made it shorter, so it’s blouse length instead? You’d still be able to test the pattern for fit on top. But the second fabric is just as pretty, if not more so. I would always consider piecing the facings. What if you put a seam in them so they are no longer L shaped? I do this all the time! I was wondering if you could skip the facings or do them in a different fabric altogether? Or used a contrasting fabric in plain red to lengthen some of the pieces? Nah, you can totally still make this work. Think of your facings as second-class citizens – prioritize the layout for the exterior pattern pieces, and if you have to seam a facing or two (I see some awkwardly, shaped C or L pieces in particular there), it’s no biggie. I’ve had to do this for a few coats and it’s seriously not a big issue! Or on a wrap dress like this, bind the neck edges with some red FOE and say goodbye to the facings altogether! I have a few problematically narrow 2mtr pieces in my stash.